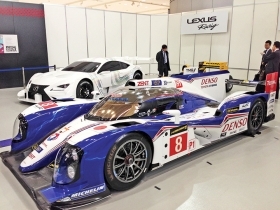 Toyota shows the TS040 Hybrid Le Mans racer, foreground, and the Lexus RC coupe racer. TOKYO -- Here's another sign that Akio Toyoda is ready to go on the offensive. For the first time in four years, his company hosted a major news conference to outline the year's motorsports activities, introduce the drivers and show off the cars. The Jan. 30 season preview was the first such event Toyoda has attended as CEO. The motorsports news conferences used to be an annual ritual for Toyota Motor Corp. But that all stopped in November 2009. The company's global racing director, Tadashi Yamashina, made headlines then for breaking into tears as the world's biggest carmaker said it was quitting Formula One, the pinnacle of the sport. But the company felt it had little choice. The global financial meltdown was in full swing. The automaker had just posted a rare net loss for the fiscal year ended March 2009. In the four years since its withdrawal from F1 racing, Toyota has kept a low profile. With the company buffeted by the economic crisis, unintentional acceleration recalls and then the massive earthquake-tsunami in Japan, it seemed unseemly to tout what critics might brand a frivolous diversion. But times have changed, and it's back on track, brash and bold. Toyoda led a clutch of the company's top brass, including global r&d chief Mitsuhisa Kato, in a paean to the pantheon of professional drivers that will pilot Toyota- and Lexus-backed cars around tracks worldwide this year. They included NASCAR's Kyle Busch and the drivers of Toyota's TS040 Hybrid Le Mans racer and the LFA Code X car at Germany's Nurburgring. Dozens of the drivers were presented onstage at Toyota's Mega Web showroom on the Tokyo waterfront, with the cars spread throughout the concourse as eye candy. It's easy to see why Toyota has rediscovered some swagger. In 2013, the company became the first automaker to produce more than 10 million vehicles. This year, it expects to be the first to pass the 10 million unit annual sales milestone. As early as the fiscal year that ends March 31, Toyota may surpass the record net income and revenue it set before the financial crisis, in the fiscal year ended March 31, 2008. The return to motorsports is a sign of renewed confidence, as Toyoda eases out of the defensive stance he's held since taking office in 2009 amid tough times. In interviews last year with Automotive News, he said it was finally time to go on the "offensive." At the motorsports news conference, executives took pains to emphasize how racing is a proving ground for the company's latest technology and the lessons learned are fed back into production cars. It also is a valuable marketing tool and attracts new fans to the brand, they said. To eke more marketing mileage, all racing outreach has been shifted to Toyota's separate marketing subsidiary, Toyota Motor Sales & Marketing Corp. It used to be handled directly under Toyota Motor Corp. Despite being flush with cash and confidence, Toyota kept one item off the table: the F1 circuit. Staying away could save the company money -- and face. Toyota's tone was cocky when it announced plans to enter F1 in 1999, backed by a massive budget that included two wind tunnels at its German motorsports center. But in eight years of F1 competition, Toyota finished second in only three races, and never first. But Toyoda emphasized that the company prefers grass-roots racing more in tune with the cars his customers actually drive. Asked about returning to the F1 circuit, Toyoda immediately fired back: "As long as I am president, we won't be doing it."